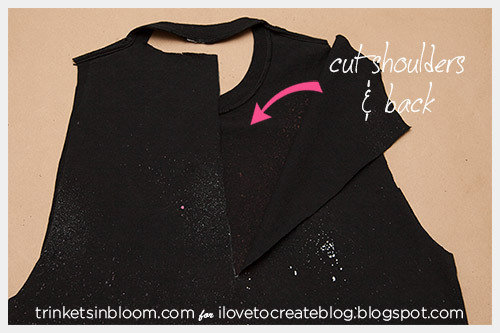 It’s amazing how a little paint and some cutting can totally transform a plain black t-shirt into a fun and out of this world (pun intended!) Galaxy Beach Cover Up! 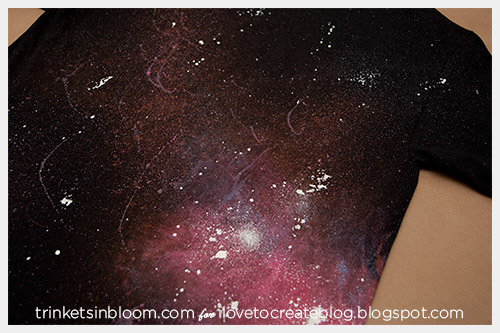 It’s so easy to create a galaxy look on a t-shirt with tulip fabric paints and once you’re done alter your t-shirt into a cute summer top or beach cover up! I kept this design a little more modest in the front and open in the back (business in the front, party in the back! ), perfect for a day at the beach. Let’s get started! 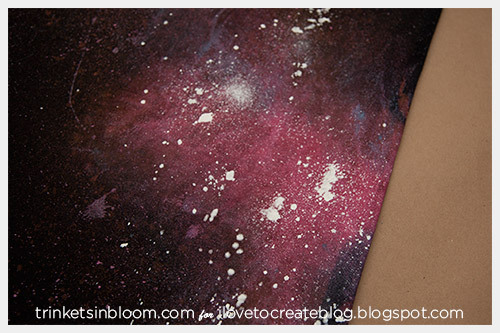 Cover the space you are working in with a plastic bag or drop cloth. In your spray bottle mix bleach and water. I mixed about 3 parts water to 1 part bleach. 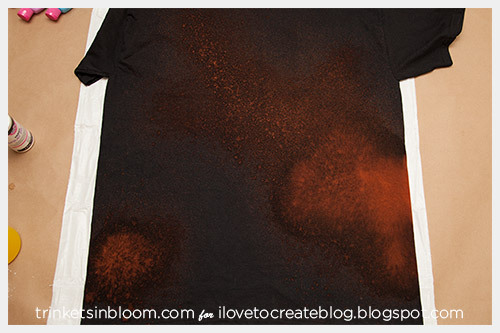 Spray your t-shirt with your bleach and water mix. 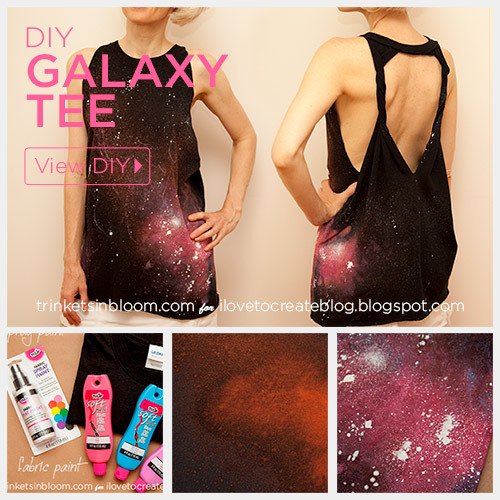 I focused on two concentrated spots and then let it spray out and across the t-shirt to give the effect of stars. Let the bleach sit for a little while. As it first sits it will turn your shirt red, the longer it sits it will turn to a medium brown and then an off white. I wanted to use the red color so I rinsed out my bleach when it was in the red stage. I started painting with the Tulip Soft Matte fabric paint in pink covering the large area where I sprayed the bleach. Then I used neon blue to add light blue effects around the edges of the pink. As I painted I mixed the paint with a lot of water. 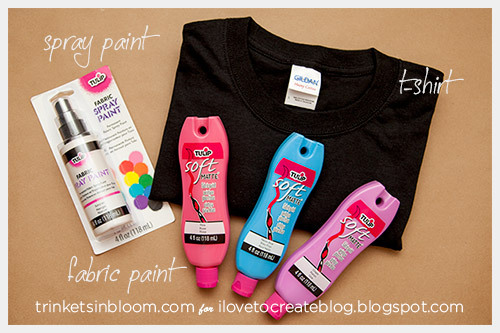 Using a stiff brush or toothbrush I splattered paint across the t-shirt. 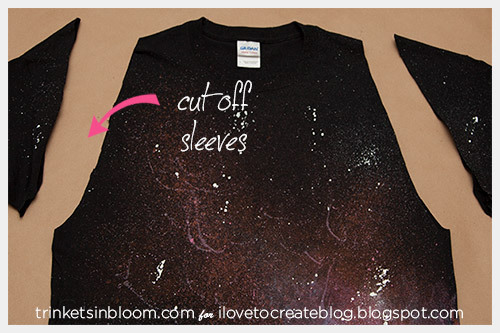 As a final touch I used the Tulip Fabric spray paint in white to add “stars” concentrating in the areas of more color and then spraying out across the t-shirt. When you are finished painting let your shirt dry. You can also wash it and dry it. Cut off the sleeves angling in toward the neck. 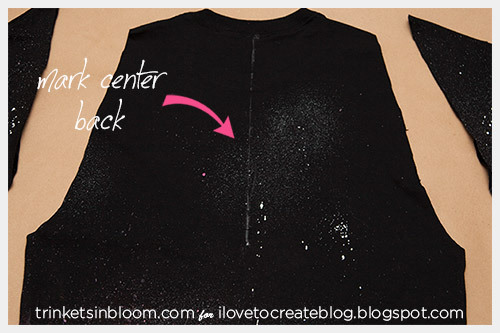 Make a straight line from the center back at the neck down to even with the bottom of the arm holes. 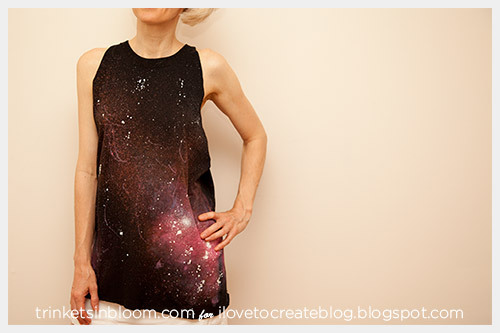 Cut along the shoulder seam to cut the top of the back off and also cut down the center back line. Twist the two sides of your back a few times. 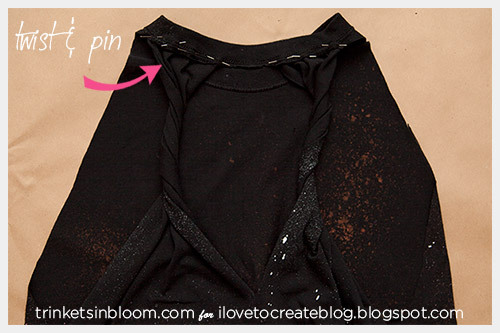 Pin the tops of your backs to the front of your shirt and sew them using your sewing machine or by hand. Now you’re ready to hit the beach or pool! 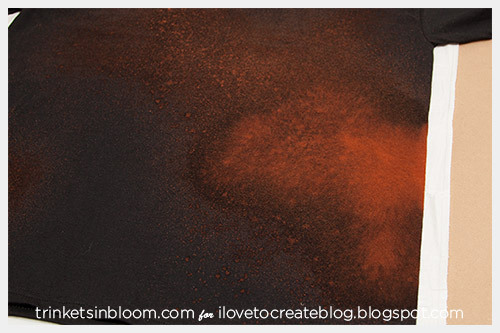 To see more fashion DIY’s check out my blog Trinkets in Bloom! Nice collection of beach cover up..:) I lvoe this post...good share..! !